Q: Do you have a stiff neck? A: No, my head and chest are arguing and my neck doesn't want to get involved. Q: You don't look sick, how can you be sick? A: In the same way that you don't look stupid. Q: Gee, are you in pain? A: Only if you define pain as an excruciating series of extremely hurtful physical sensations. Q: Are you sure you're in pain? A: Alright, ya got me. I just take the Vicodin in order to stop other people from becoming addicted. A: Oh no, my screaming was just to clear the excess phleghm from my larynx. Q: Why don't you stop slouching and stand up straight? A: I can't. I'm watching an exciting ant race on the sidewalk and I've bet $5,000 on the outcome. Q: Can I help you? A: That depends. How much Community service time do you have left, Winona? A: Never Better ... Ohhhh wait, you mean TODAY. Q: Aren't you feeling better YET? A: What do you drooling Pollyannas NOT get about Nihilistic Existentialism? Q: Can't you move any faster? A: I could, but that would violate the terms of my probation ... for murder. Q: You're doing this just for the attention, aren't you? A: That, and the million dollars they give away to the winner of the "most egregious pain" contest. Q: Ehhh, everyone get arthritis, right? A: No, AS is a chronic degenerative rheumatic disease which primarily strikes young people. It is NOT the same kind of 'wear and tear' or 'old age' arthritis that "everyone gets." It is systemic and can be more painful and affect more specific areas than the common arthritis that "everyone gets." This disease can fuse your spine and neck while you're still young. 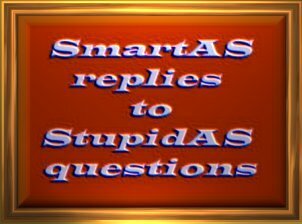 It's a serious illness, with often devastating consequences, and I would appreciate it if you didn't make such rampant ignorant assumptions and ridiculous generalizations about something of which you have absolutely no knowledge ..."
More SmartAS replies to StupidAS questions coming soon.